IMAGE: Location of the bridges. Dublin’s Docklands cycle paths on the North Quays are to become a little less disjointed as pedestrian and cycling bridges are to be built over the mouth of the Royal Canal. Dublin City Council said it is to lodge a Part 8 planning application for a pedestrian and a cycle bridge at Spencer Dock between the Convention Centre and the Samuel Beckett Bridge. The two bridges are to be placed beside the existing Scherzer rolling lift bridges over the canal — the two new bridges will be 3.5 meters wide between their handrails and 12m long. The council officials said that the bridge closest to the Liffey will be for pedestrians and the cycleway bridge will be closer to the Scherzer Bridges. The cycleway bridge will connect to the cycle paths and lanes on both side of the bridge. 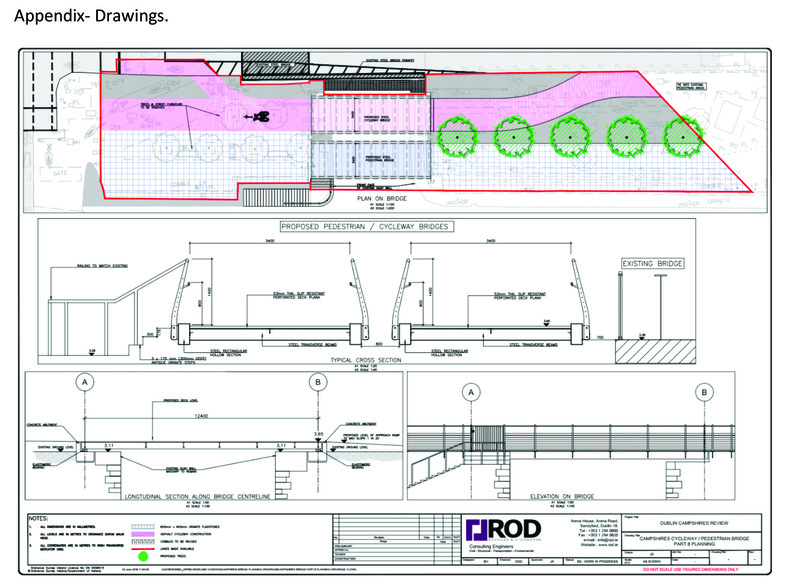 The council said that the design of the bridge is shaped by an aim to ensure that the impact on the stone quay walls and visually on the Scherzer bridges is minimised. This will make a huge change to the area. The super narrow pedestrian on the edge of the Scherzer Bridge is barely wide enough for one pedestrian. It’ll also removes the need for cyclists to leave the okay cycle lanes on North Wall Quay back onto the road, which is packed with buses coming from the Port Tunnel. The quicker the council can advance this project the better. Good news. Hopefully it’ll be built soon. Thanks for the update. Slowly the rest of the world is catching up with The Netherlands. This is unlikely to solve the issue of people cycling eastwards from being squeezed by coaches and trucks on the narrow bridge – crossing to access the new cycling bridge doesn’t sound like a safe move, so they are likely to stay on the road. Of course, this all changes once the Liffey route is in place. I BIKE Dublin has recommended to the council to place signs advising cyclists to take the centre of the lane in order to dissuade drivers from dangerous overtakings at this bridge. This request was sent four months ago. 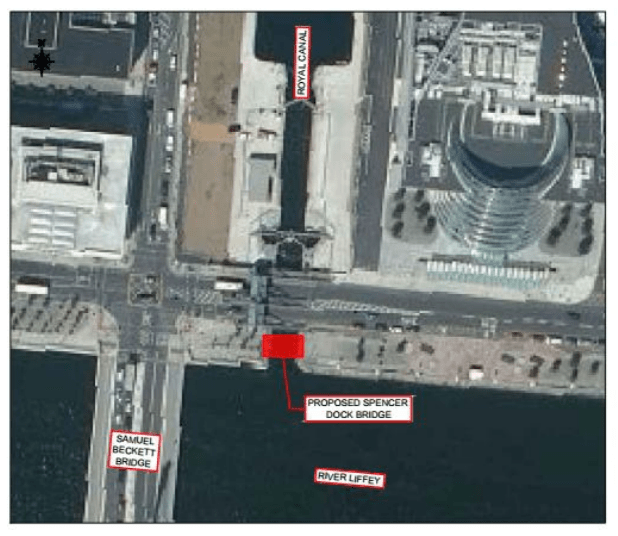 The drawbridges at Georges Dock are much narrower and need safety work also. The slip back onto the road west of the bridge seems like it has a sharp turn, and it should have more protection than a ghost island. I agree with Bruce about the angle of the rail, why waste bridge space by inward angles rails. The reason why the railings are ‘angled in’ they feel safer than ‘angled out’. Secondly climbing is more difficult than a straight / angled out. Another reason is when lights are put in/on the bottom side of the bars they lit the surface / edge better. In some cases a angled fence/railings gives a more esthetic picture, also depending on the materials used. Of course the effective width between the bars of the railings preferably is 4 meters for bi-directional cycling. And last but not least, the connections between the bridge and footpaths plus cycle paths should be smooth and safe (= wide enough). And the end of the railings / bars should never be sharp. Yes, this is unacceptable and the foot-cycle-bridges should be put in place a.s.a.p.